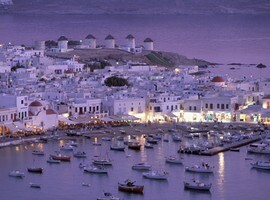 Perhaps the most famous Greek island, Mykonos has always been one of the most popular tourist islands. 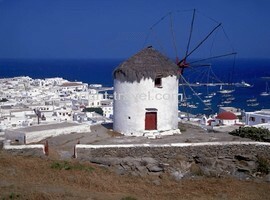 However, the island still maintains its cycladic features and traditional look, consisted of white houses with blue details, old windmills, little churches and paved twisted narrow streets. Ancient Delos is a really special place to be, as it was considered by the ancient Greeks to be one of the holiest of sanctuaries, the fixed point around which the other Cycladic islands circled… You can go there by boat, about half an hour distance from Mykonos, and spend the whole day exploring places such as the Entrance to the Sacred Way, Sanctuary of Apollo, the Lion District, Maritime and Theater Quarters, Mount Kinthos and the ancient Harbour. 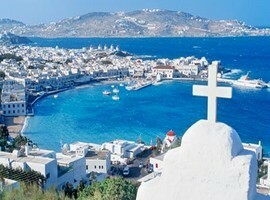 The main city of the Island is called Chora, with the famous Matogianni street, the most commercial street of Mykonos. Walking down this road you will find a lot of shops with jewels, clothes and popular art. Chora is the place where you can rent a car or take the bus, if you want to explore the rest of the island. 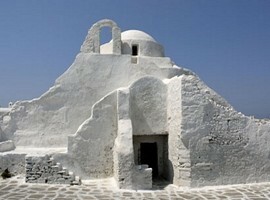 In the town of Mykonos, Hora and almost all Mykonos you will see the typical cubic Cycladic style of architecture. 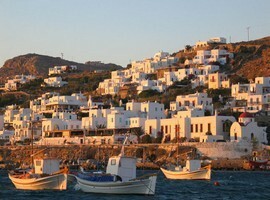 Small and white houses and villas, often with a single floor resembling sugar cubes scattered over the hills and beaches. Mykonos town offers a different architectural style that is unique to the region. Here, there are narrow streets amongst many buildings reminiscent of medieval style. Each house is built alongside the road, with small steps to terraces. The wooden rails of the stairs are painted in different colors like blue, red ocher and wooden balconies. And here, we find a variant of the ubiquitous blue and white decor of Greece. In Mykonos town the woodwork of every house is painted with almost all the colors of the rainbow, so along with whitewashed walls and blue sky, the effect is absolutely magical. However, the main reason this place is known for, is its night life. 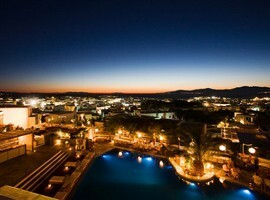 One of the most popular places for wild partying, dancing and staying up till the sun rises. When night falls, people start gathering in the bars, clubs and various beach parties that take place everywhere. Famous Djs Hit the decks and professional dancers set the rhythm. 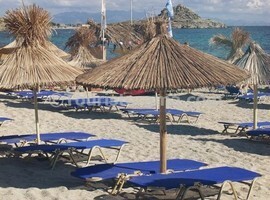 The most famous beaches of Mykonos are Platis Yalos, Paradise, Agari and Elia. Platis Yialos is the most easily accessible because it’s the nearest to Chora. It is full of bars, reastaurants and watersports facilities. 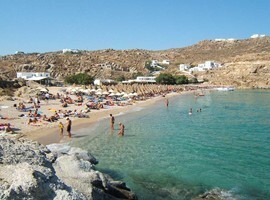 Iti is one of the most crowded beaches of Mykonos. If you want something more calm and quiet, you should go to Agari beach. Next to this is Elia, a place very similar to Platis Yalos. If you are the party person, then the best place for you is the Paradise beach with the most famous clubs and all day Parties. The music here is always loud and people never stop dancing. There are good bus connections to Mykonos, and several car rental offices and motorcycle. 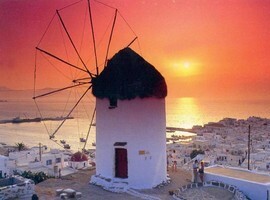 In Mykonos you will find many taxis and boats that trips to beaches. 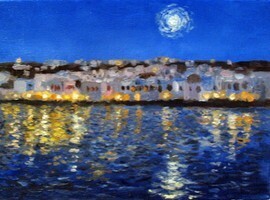 The evening is a bit difficult if you stay away from the center of Mykonos town and looking for a taxi. If you rent a car should know that you cannot drive through town and parking is a problem particularly during peak periods.